The much-anticipated Camelback Lodge & Aquatopia Indoor Waterpark is now open, welcoming guests to the biggest indoor waterpark in the Northeast, and the largest and most innovative waterpark hotel ever constructed in the U.S. in a single phase. The $163 million, eight-story Camelback Lodge, located at the base of Camelback Mountain, transforms Camelback Resort into a year-round family and adventure destination. Designed to complement Camelback Resort’s existing seasonal outdoor recreation, including Camelbeach outdoor waterpark, skiing, snowboarding, snowtubing, ziplining, a treetops obstacle course, mountain coaster and more, Camelback Lodge will serve as the largest ski in/ski out indoor waterpark resort in the U.S. Nestled in the heart of the Pocono Mountains, an area that welcomes 22 million leisure travelers annually from New York, New Jersey and Philadelphia, Camelback Lodge has wide appeal to a broad audience including families and seasonal outdoor enthusiasts. Aquatopia Indoor Waterpark sprawls 125,000 square-feet, and is the largest indoor waterpark in the Northeast, boasting seven pools, 13 waterslides and a multitude of thrilling water attractions. Uniquely designed to be unlike any other indoor waterpark in the U.S., Aquatopia is home to several never-before-seen attractions and slides including: Storm Chaser, the longest gravity-defying uphill water coaster to exist in any indoor waterpark in the U.S.; Venus SlydeTrap, a world-premiere attraction that combines three exhilarating waterslide experiences in one; The Lost River, an immersive, theatrical and dark adventure river experience featuring amusement park level theming; and Kartrite’s Quest, the world’s first ‘Next Generation’ fully themed and immersive multi-level exploration AquaPlay structure. Waterpark favorites also abound, including The Great Ka-Na-Gawa Wavepool, Bombora FlowRider surfing simulator, Mystic Springs indoor/outdoor family hot tub and several waterslides that appeal to everyone from brave thrill seekers to timid toddlers. Situated under 1.5 acres of Texlon® transparent roof – the largest install in North America – Aquatopia’s innovative design allows guests to soak up the sun indoors at a comfortable 84-degrees, year-round. More than 120 lifeguards trained and certified through Ellis & Associates, the industry leader in aquatic safety, oversee the safety operations and regulations for Aquatopia Indoor Waterpark. Coastguard certified lifejackets are available for use and lockers are available for rental. On the drier side, the 45,000 square-foot Arcadia Family Adventure Center offers two levels of themed activities including: more than 100 video, interactive and ticket redemption games; The Ascent, a vertical rock climbing wall and K2 Klimb overhead ropes courses for adults and kids; Meh-Tah’s (Not So) Mini Golf; Lazer Runner, black light laser tag; Polka Dot Pots children’s arts and crafts; Oasis Kids Spa offering manicures and pedicures to the youngest of guests; and Kartrite’s Kids Quest, a themed soft play area for the littlest of adventurers. Adults wanting to retreat for a massage, nail treatment or workout can find respite at Serenity Spa and Fitness Centre. Camelback Lodge’s mountain-modern architecture and design extends throughout all 453 guest rooms and suites. Sixteen different suite styles, including loft fireplace suites, balcony suites, family suites with bunk beds, and one- and two-bedroom suites, some with full kitchens, will accommodate a variety of guests from couples to extended family reunions. All guest suites are equipped with TVs, microwaves, mini-refrigerators, ironing boards and safes. Three sit-down restaurants and multiple bars and eateries add to the unique mix of amenities. No matter the season, Trails End Pub & Grille is a conveniently located restaurant for visitors. Guests can ski or board right up in the winter, warm up by the fire and enjoy a bite before heading back to the peak on the Stevenson Chair Lift. The Trails End Pub & Grille menu features an extensive burger selection, cast iron mac and cheese, steak dinners and more. The restaurant also serves specialty drinks and craft beer. Flanking the grand lobby are: Hemispheres, offering a buffet-style family atmosphere that includes live action-cooking stations and many choices for both adults and children; Neptunes, a more intimate venue with a sushi bar, small plates, seafood selections, craft beer and wine, and specialty cocktails with a glass panel panoramic view of Aquatopia Indoor Waterpark; and World Bazaar & Coffee Shop, offering specialty coffee drinks, pastries and snacks. Located in the heart of the action of Aquatopia Indoor Waterpark, guests can refuel with burgers, sandwiches, pizza and more at Hungry Camel and Colonial Columns, and indulge in dessert at Sweet Discovery with homemade yogurt, assorted candies, fudge cookies and more. Adult beverages are available in and out of the pool inside Aquatopia at Moroccan Nights and Flyboys, the adults-only swim-up bar. Meeting and conference space abounds with 20,000 square feet of flexible meeting and entertainment space at the new Camelback Lodge, in addition to the 18,000 square feet of existing space in the base ski lodges. Camelback Resort is an ideal setting for team building events by integrating indoor and outdoor activities including ropes courses, rock climbing and more, as well as a scenic location for meetings and weddings, school and sports team outings, bar and bat mitzvahs, Sweet 16 parties and other celebrations. 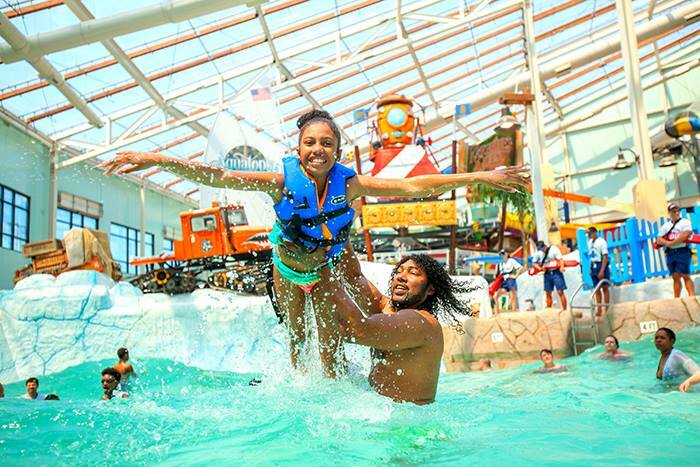 Camelback Lodge is offering limited-time Sneak Peek day passes from May 1 to June 14, 2015 to the normally exclusive Aquatopia Indoor Waterpark. Beginning June 15, 2015, Aquatopia will only be accessible as part of a hotel reservation, and day passes will only be available for Camelback Resort guests when they show proof of purchase from the outdoor Camelbeach Waterpark, Camelback Mountain Adventures or winter lift pass. Rates for guests 48 inches and over are $39.99 and $29.99 for guests under 48 inches. Throughout the 20-month construction process, Camelback developers focused on hiring subcontractors and suppliers locally and throughout Pennsylvania whenever possible, investing $21 million directly in the region, and employing more than 500 construction jobs. Now open, Camelback Lodge has hired 600 full- and part–time employees in addition to the 1,600 people employed through Camelback Resort’s seasonal operations. In its first year of operation, the new lodge is projected to attract more than 600,000 visitors and according to an Economic Impact Study, it is projected to generate tax revenues in excess of $152 million for the township, county and state over a 10-year period. For more information about Camelback Lodge or to make a reservation, call 855.515.1283 or visit www.CamelbackResort.com. The Camelback Lodge & Aquatopia Indoor Waterpark ownership group is a partnership comprised of Camelback Resort and Camelbeach Waterpark co-owners Arthur Berry III and Ken Ellis, and Stand Rock Hospitality partners Pete Helland Jr., Pat Helland, Tim Lucke and Tim Gantz. Arthur Berry III and Ken Ellis first met on the Saratoga, New York campus of Skidmore College in 1982. Through their friendship and common vision to bring fun to their family and friends, they purchased Camelback Resort in June 2005 with the goal of building an indoor waterpark resort. The resort has seen substantial growth in nine years of ownership with capital improvement to Camelback’s winter operations, snowtubing park, Camelbeach Waterpark and the opening of Camelback Mountain Adventures. Stand Rock Hospitality is the development and management company for Camelback Lodge & Aquatopia Indoor Waterpark. Comprised of four partners with a long legacy in the indoor and outdoor waterpark and entertainment industry, Pete Helland Jr., Pat Helland, Tim Lucke and Tim Gantz, and are no strangers to grand-scale waterpark resorts. Hailing from Wisconsin Dells, Wisconsin, the “Waterpark Capital of the World,” each partner brings substantial experience, among them the former owner and operator of America’s Largest Outdoor Waterpark, Noah’s Ark. More recently, Stand Rock Hospitality developed and manages the 716 key Wilderness at the Smokies Resort in Pigeon Forge, Tennessee, and helped develop and is co-owner of the largest indoor waterpark resort property in the U.S., Wilderness Resort in Wisconsin Dells. f you’re looking to rent a house in the Poconos, check out www.RentalsInThePoconos.com, the region’s biggest vacation rentals resource. It lists over 500 rental homes around Pennsylvania’s Pocono Mountains, including Camelback, Lake Wallenpaupack, Lake Harmony, Jack Frost, Jim Thorpe, Lake Ariel, Blue Mountain and much more. It’s a one-stop website for planning your Pocono vacation, featuring local attractions, ski resort information, weather updates and reviews! And of course, it has a full list of the biggest Pocono events this year.